Looks kinda gross but tastes good! Chili. I love it, don’t you? Unfortunately, my husband doesn’t love beans and he can’t tolerate really spicy food anymore so I don’t make it too often these days. But I do often modify old favorites into something we both can enjoy. I also love to cook using whatever I just happen to have on hand (which is something you just have to get used to when you take part in a CSA). I don’t want to have to run to the store for a single ingredient or two (have I told you how we’re a good 20 minutes from the nearest full service grocery store?) so being comfortable with substituting ingredients is really important. Last week I desperately wanted a warm bowl of chili but I didn’t have bell peppers, corn, cilantro or anything else chili like on hand, but I did have kale, kuri squash (which I’ve never had before) and parsnips so I decided to roll with it and make a chili anyhow. It worked! The texture of the squash and parsnips blended in really well with the turkey (a great fill in for my bean cravings) and the kale was completely unnoticeable texture-wise. Using squash, kale and parsnips also gave this chili a nice earthy flavor that I think is a nice change from most chilis. 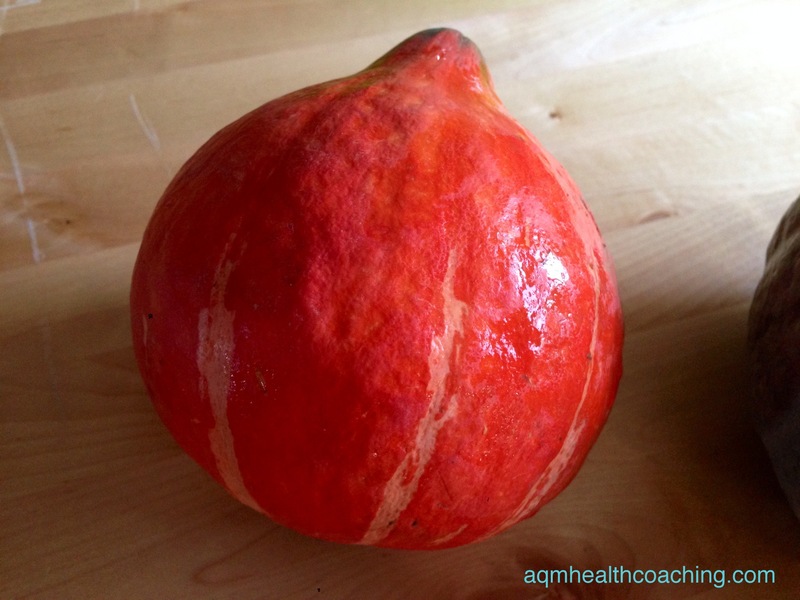 Red Kuri squash – it’s thin skinned (edible actually) and to me tastes like a cross between butternut and kabocha. Buttery texture! This doesn’t really need to be topped with anything – I think it’s flavorful enough to stand on it’s own but if you enjoy topping chili with other things then I think sliced avocado, sliced scallions and my dairy free sour cream would work awesomely. Feel free to swap out the ground turkey for ground beef or beans or whatever other protein you like. Don’t let the need for specific recipes hold you back from experimenting in the kitchen. If you have a couple of techniques down, you can experiment confidently. Use your intuition. If you have a palate and preferences, you’ll know what you will like. Cooking healthy on a regular basis becomes a lot easier when you release some of the rules that complicate our lives. And if something doesn’t turn out so tasty? So what? It’s just one meal. On to the next! Heat a 4 qt sauce pan or dutch oven over medium heat and add 1 tbsp olive oil. When the pan is hot, add the ground turkey and cook, stirring occasionally, until it is no longer pink. Add in the diced onion and cook for 5 minutes. Add in the parsnips, kale, chopped squash, cumin, chili powder, cacao powder, oregano, garlic powder and fire roasted diced tomatoes (and cayenne or chipotle in adobo if using). Bring to a low simmer and cook for 25 to 30 minutes (covered) or until vegetables are soft, stirring occasionally. Season with sea salt and pepper and adjust seasoning if needed. Serve as is or top with avocado, cilantro & scallions. *Note: You have two options for preparing the kuri squash for this recipe. My personal preference is #2 as (I’ve said this before on this blog) I don’t like cutting into really hard squash. I’m rather accident prone and I just know I’ll lose a finger one of these days if I try! #2 obviously takes a little longer than #1 so just keep that in mind. 1) Cut in half, scoop out the seeds/membrane and then chop the flesh into 1 inch chunks (you can keep the skin on – it’s edible). 2) Roast the entire squash in a 350 degree oven until soft enough to cut in half easily, about 30 minutes. Let cool briefly, cut in half, peel, scoop out seeds/membrane and then chop into 1 inch chunks. 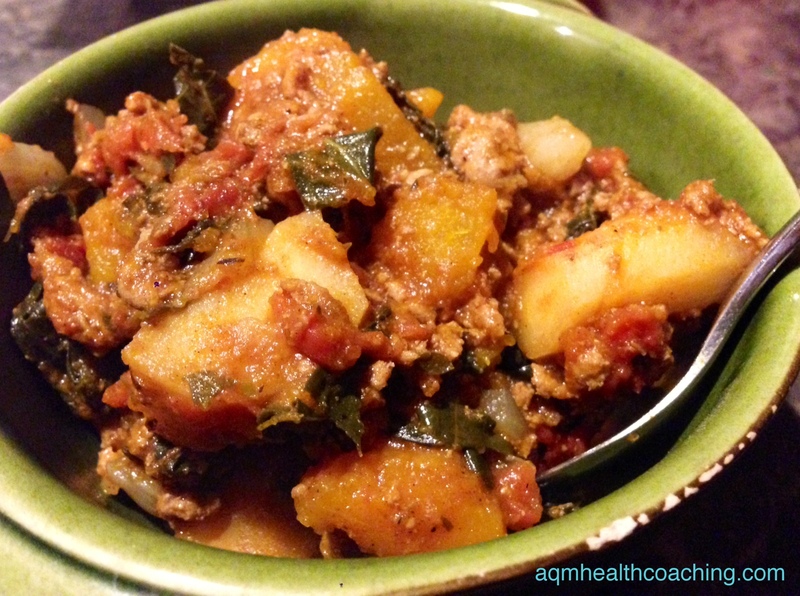 This entry was posted in Dairy Free, Gluten Free, Recipes, Tree nut and Peanut free and tagged kuri squash, mexican, no bean chili, parsnips, turkey chili on November 2, 2014 by Andrea Quigley Maynard.